This is the size I use for cooking a single batch of queso. It has ample room for stirring and whisking without spilling over the edge. For serving, this size will hold a double batch of finished queso. It has a convenient warm setting, and the crock is removable for easy cleaning in the dishwasher. This economical, small 1.5 qt. slow cooker is perfect for dips and small batches. It has a removable, dishwasher safe stoneware insert. 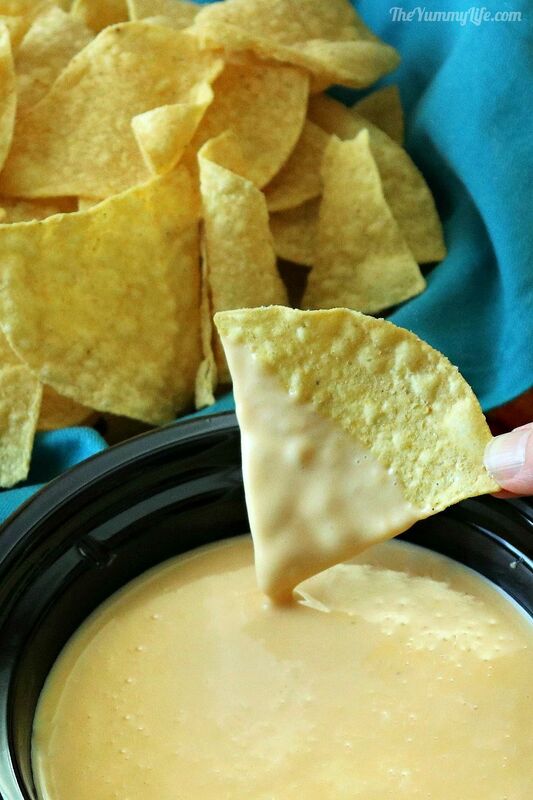 The "warm" setting is perfect for keep queso at the perfect temperature for easy dipping. This holds a single batch of queso. I use this little beauty without the lid when I serve queso on my coffee table where I don't have easy access to electricity. This is another tool that gets lots of use in my kitchen. It's essential for this recipe to achieve a smooth sauce. 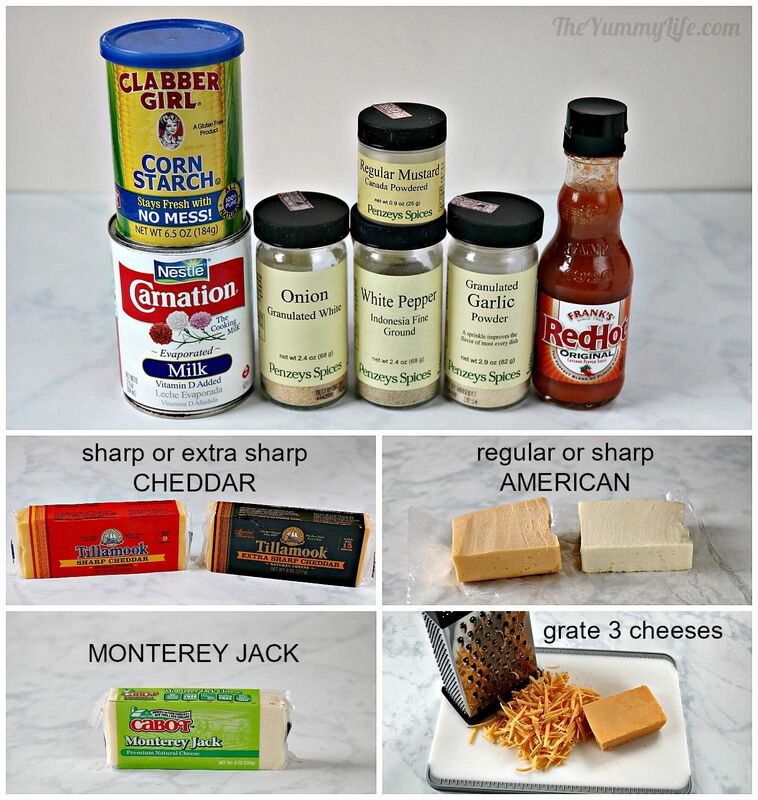 Easy cheese sauce for nachos, fries, pretzels and more. Made with real cheese--no Velveeta! Make-ahead convenience. This easy cheese sauce is perfect for nachos, fries, pretzels and more. Made with real cheese--no Velveeta. Make ahead convenience. *Grate sharp, American, and Jack cheeses on large holes of box grater. (Pre-shredded cheese not recommended.) If cheeses aren't available pre-packaged, try the deli counter. Ask them to cut a 1-inch thick piece of cheddar or American cheese for approx. 8 oz. If pre-sliced American cheese is all that's available, dice it into small pieces before adding it with the other queso ingredients.For blanco queso, use white cheddar and white American cheese. COOK ON STOVE-TOP: Place on stove-top burner over low heat, cooking uncovered and stirring frequently until cheese has mostly melted; then use a whisk to continue stirring until completely smooth. (Be patient, it can take up to 15 minutes for all of the cheese bits to completely melt into a smooth sauce.) If too thick, add more evaporated milk, 2 tablespoons at a time, until desired consistency. COOK IN SLOW COOKER: Coat 2 to 3 qt. slow cooker insert with cooking spray. Cover and cook on low for 1-1/2 hours; whisk until smooth. Keep warm on warm setting. OPTIONAL STIR-INS: If desired, stir into queso, diced tomatoes and green chiles, and minced jalapenos. TO KEEP WARM FOR SERVING, serve directly from a slow cooker or fondue pot. TO REHEAT: Microwave on high, 20-30 seconds for a single serving, or 2-4 minutes for a full batch. Microwave just until heated, stirring after each 30 seconds. Once completely heated through, whisk until smooth. May also reheat on low on stove top or in a slow cooker, whisking frequently until complete heated and smooth. Thin with additional evaporated milk, if needed. SERVE with tortilla chips or French fries. Sauce is also good drizzled over vegetables like baked potatoes, broccoli, and asparagus. ADDITIONAL TOPPINGS for nachos include guacamole, salsa, sour cream, cilantro, green onions, black olives, black or pinto beans, roasted corn, pickled or fresh jalapeno slices. This easy, cheesy, velvety smooth sauce is a flavorful blend of 3 cheeses that can be made in 15 minutes on the stove top; or, you can set-it-and-forget-it for 90 minutes in a slow cooker. Both methods are explained in this post. This recipe is made with real cheese--no Velveeta, fillers or mystery ingredients found in purchased jars of cheese sauce. This is my favorite cheese sauce to drizzle on nachos or to use as a dip for chips, veggies, or fries. It's similar to my 5-minute Microwave Ballpark Cheese Sauce. NOTE: The recipe uses 3 kinds of cheese. I recommend that you buy them in block form and grate with the large holes of a box grater. Pre-shredded cheese is not recommended; it is coated with a substance to prevent clumping that makes it more difficult to melt into a smooth sauce. Regular or Sharp American Cheese. This is usually available in block form at the grocery store deli counter, making it easier to shred than the pre-sliced version. Ask them to cut a 1" thick chunk--that should be about 8 oz. Also, the deli cheese is likely to be better quality and "real" cheese. Often the pre-sliced, packaged American cheese is a cheese "product" with less desireable ingredients. My grocery store deli carries Boar's Head American cheese which is very good quality. If pre-sliced American cheese is all that's available, dice it into small pieces before adding it with the other queso ingredients. Bottled Hot Sauce -- this is optional, but it adds to the flavor; if you don't like spice, reduce or omit. 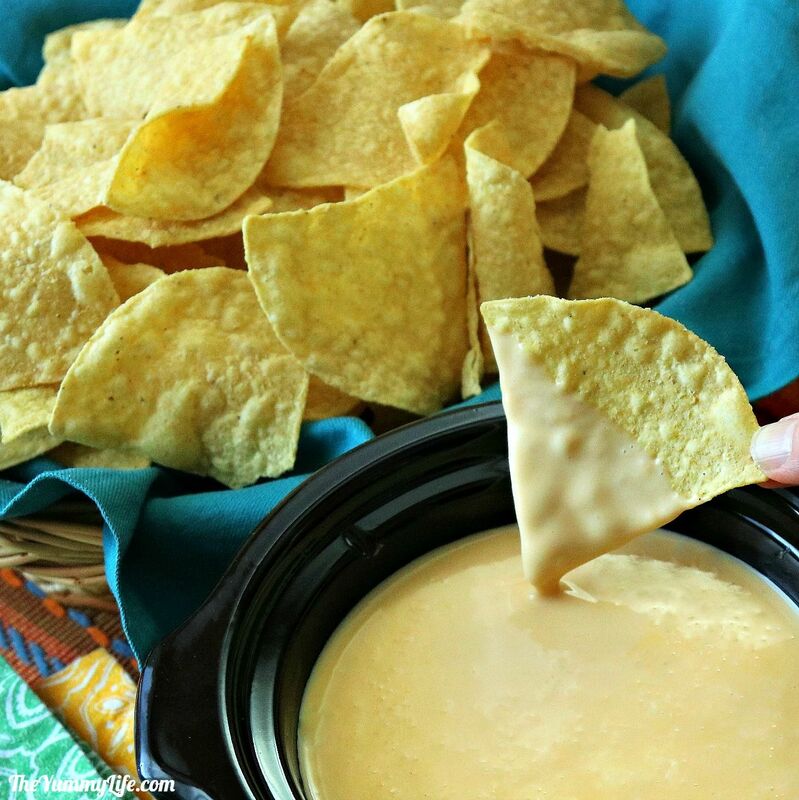 Prefer white queso? Use all-white versions of the cheeses. Cheddar and American are often available in both orange and white. The deli counter at my grocery store has both sharp Cheddar and American cheese that is white. If you want to replicate the popular Velvetta & Rotel queso, you can add 1 to 2 cans of drained Rotel (a combo of diced tomatoes and chiles) or add drained canned diced roasted tomatoes, canned green chiles, and diced jalapenos. Me? 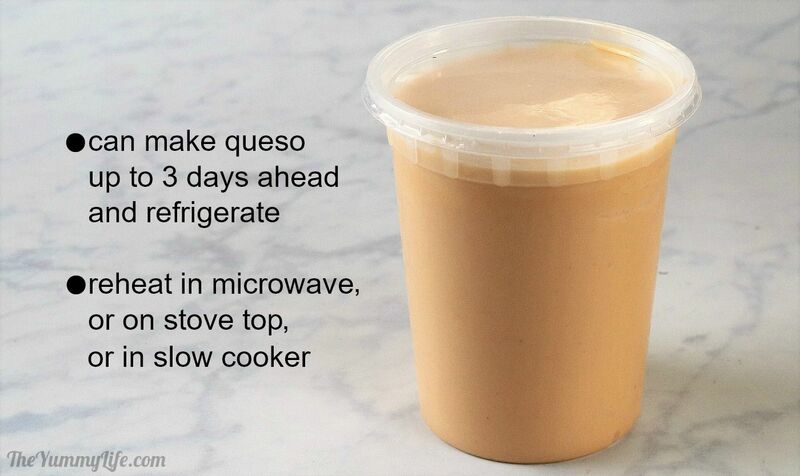 I prefer to make a plain queso sauce and let everyone add whatever toppings they like. That way I don't have to worry about the spice level or other individual preferences. Cover and cook on low for 90 minutes. Whisk until smooth, lower to warm setting to hold and serve. If queso thickens too much, stir in additional evaporated milk, 1-2 tablespoons at a time. Over low heat, cook uncovered, stirring frequently with a flat bottom rubber spatula or wooden spoon; scrape the bottom of the pan as you stir to prevent scorching. When cheese has mostly melted into the hot milk, switch to a whisk, stirring and whisking until smooth. NOTE: Be patient--It takes around 15 minutes for this to cook and whisk into a smooth sauce. If it's lumpy, keep whisking! This makes a velvety, smooth sauce. 1. In a small slow cooker. If you have access to electricity in the serving area, this is the easiest option. The 3-quart slow cooker pictured above for cooking the sauce is big enough to serve a double batch of queso. I have a small, 1.5 qt. 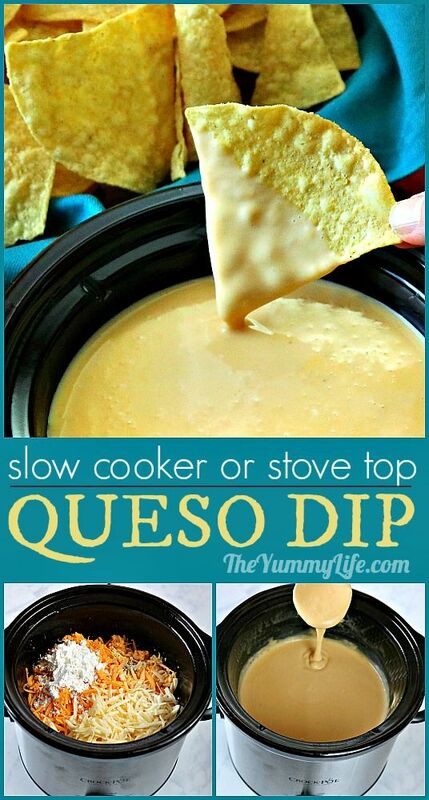 slow cooker that is perfect for serving a single batch of queso. Set it out with a basket of tortilla chips and a variety of toppings and let everyone customize their nachos however they like. view on Amazon: my mini slow cooker (with removable crock for easy dishwasher cleaning) Economy pricing, too! 2. In a fondue pot that uses a candle or sterno can for heat. This is a great option if you aren't serving the queso where there's easy access to electricity. 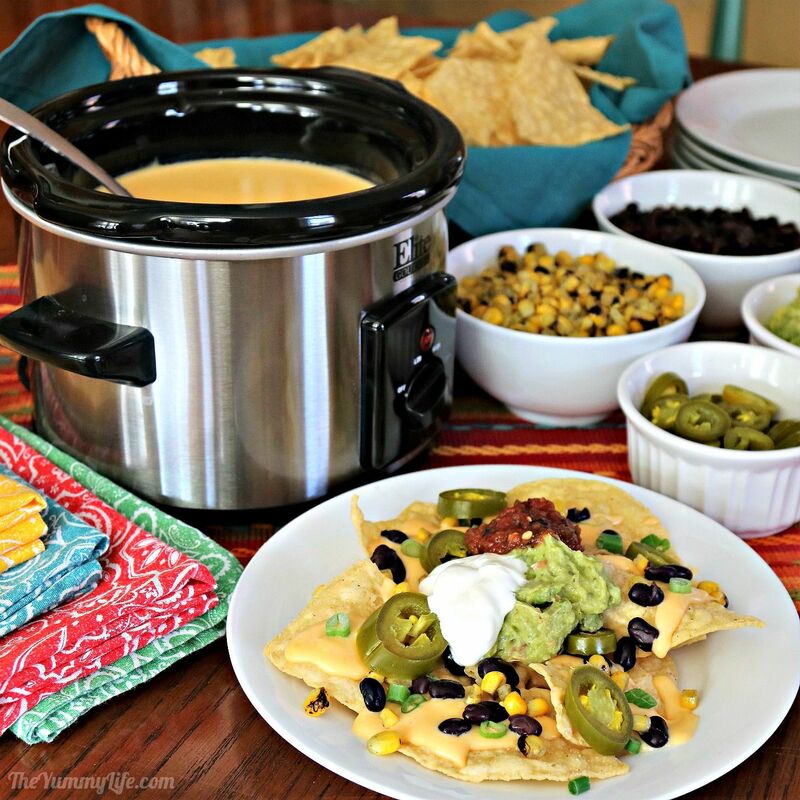 I use my fondue pot when I'm serving queso on our coffee table while we're viewing sports events on the TV. Make ahead convenience! You can make this queso up to 3 days ahead, refrigerate, and reheat it gently on the low heat, stirring often, in a slow cooker or microwave, or on the stove top. Once it's completely heated, whisk until smooth. Keep some evaporated milk on hand in case it needs thinning. Heat up the whole batch, or just a small portion for individual snacking. Reheat in large or small portions. 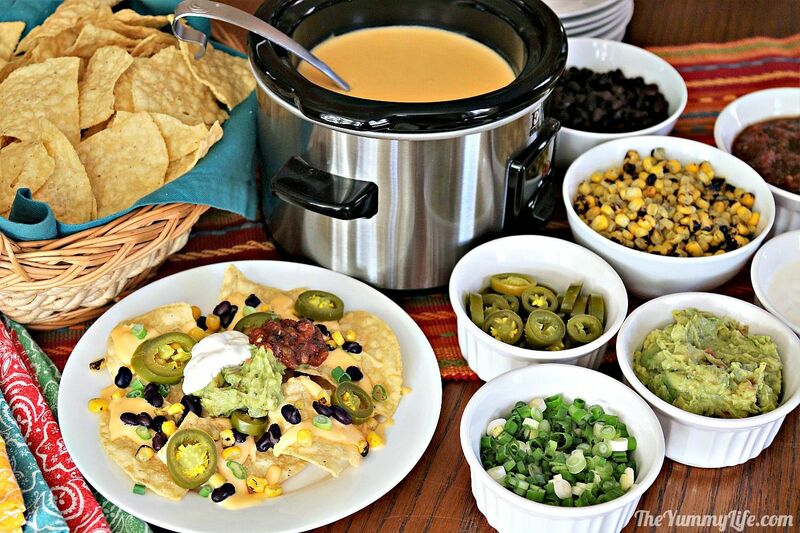 When I was creating this recipe and in the process ended up with several batches of queso in my fridge, I took it to share at my sons' company, Less Annoying CRM, along with chips and a few toppings. Over the course of 2 or 3 days, their dozen or so employees heated up individual portions of queso in 20-30 seconds in the microwave for snacking at work. T-Man reported back that it heated up well and tasted great. Throw a Nacho Party! I have a separate post with detailed topping suggestions along with beverages and dessert that are perfect to serve with nachos. 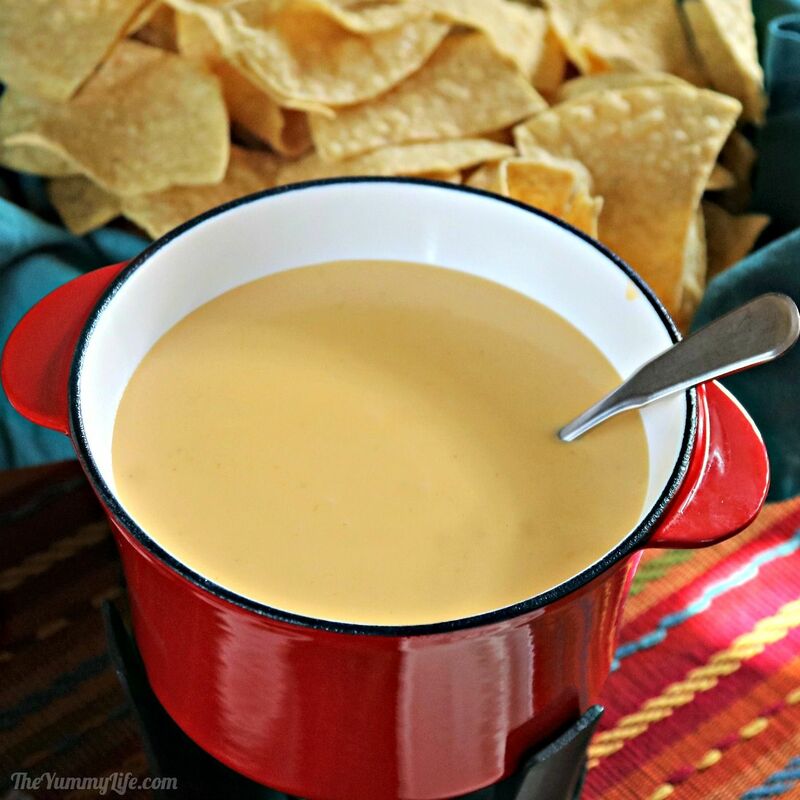 This queso is also a great addition to my Mexican Taco Bowl Buffet Dinner Party and Baked Potato Bar. Everyone loves dunking chips in this smooth, cheesy sauce. Always a crowd pleaser!